....with a viewer beware warning!! Grandma J has had an extremely busy week. Hopefully she's the only person in the whole wide world who had to do the following all in one week. Renew her lease with an increase in rent, an additional fee for water, a jump in the pet rent for JJ. This makes for a huge increase and they can break it up into different ridiculous categories but it's still one big increase. This also means that Grandma J has no problem letting JJ use all the facilities since he pays rent. One of his favorites? The billiard room. Her car insurance and her renters’ policy came due. 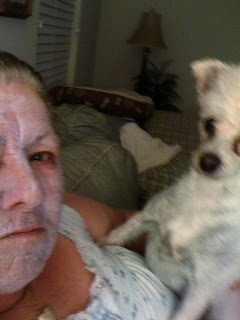 Grandma J's Sirius satellite radio expired.....yeah $179 a year with no add ons. The new dental insurance went into effect, with all kinds of faxes and scans being sent to the dentist and the insurer. The laptop got fixed under warranty...thank you Baby Jesus! But......the free trial of Microsoft Office 2010 expired, so Grandma J had to download the full version because she couldn't access some of the docs she had in Word until she did..... $149. Big Brother 13 premiered, and Grandma J figured since she pretty much broke the bank she might as well buy the three month subscription for the 24/7 live feed. It's time for the viewer warning...which means you should stop reading now if you have a weak stomach, or maybe even a full stomach. Grandma J suggests that you ask all children and pets to please leave the room as a precautionary measure. She will not be responsible for any psychological issues caused by the viewing of the following photos. 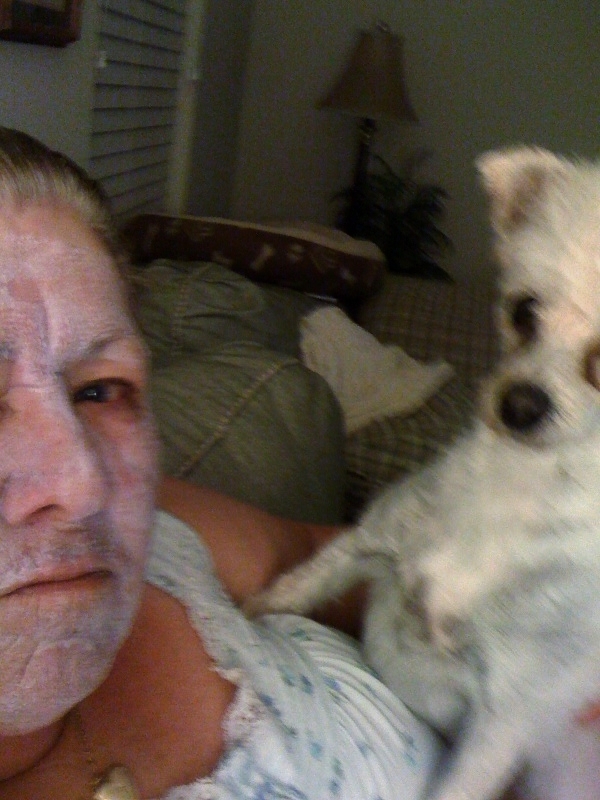 Once in a while, when the moon becomes a mere sliver of a crescent, Grandma J will decide to give herself a facial. JJ has a very hard time recognizing her.....and the image scares the beegeezus out of him. Can you tell by the look on his face? Are you starting to get a bit queezy yourself? Then he takes a taste just to make sure it's his Grandma J. Gotta love this guy. Oh my gosh.....you are so darn funny. JJ might need a facial too. I loathe those weeks where all you do is write checks! We bought the lifetime subscription for sirius and just bit the BIG bullet. I feel your pain. I just added my 16 year old new driver to my policy while also trying to find renter's insurance that will be ok with a woodstove and not charge me crazy fees. I'm also waiting to see if I can actually move into the new house because right now the person there is being evicted. And while he's been there he's been claiming he owns the place and has been trying to "sell" it for a $10K deposit... which involved me testifying in court. But is JJ any good at pool? If so, I see a great way to make some $$ in your future! You shouldn't scare JJ like that. It's animal abuse. Ha! That's great. I'm sorry about all your expenses this week. Those kinds of weeks are frustrating. The animal fee in rentals always frustrates me. I understand that if someone let their dog destroy the place, they need some compensation. But for those of us who wouldn't let that happen, it's annoying. Hey, smear some chocolate on your face and I'll lick you too. wink! 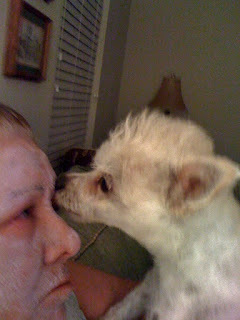 Isn't it great that our puppies love us no matter what we look like. I hate those weeks/months when everything is due or breaks!